This shoot is a perfect example of never knowing when your phone might ring with your next interesting project. In this case I received a call on a Friday at five in the afternoon from the architectural firm Bergmeyer Associates out of Boston. 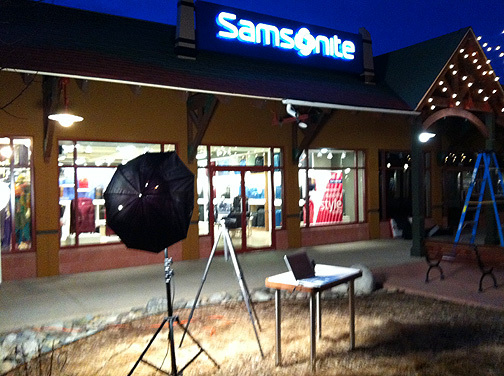 They needed a photographer to shoot a project of theirs here in Colorado for a job they just completed for their client Samsonite. 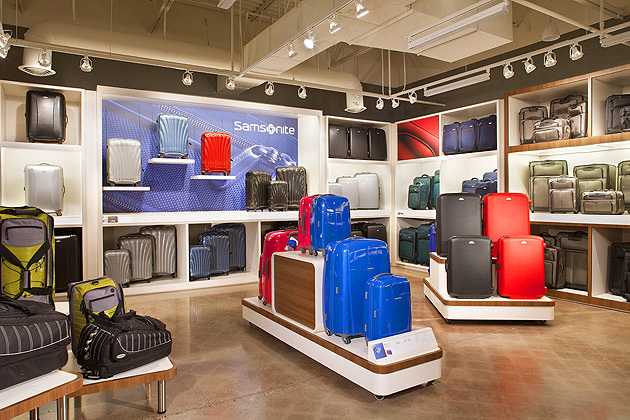 This was a new flag-ship store for Samsonite. I was informed that the shoot needed to take place the following Wednesday and that the Architect would be flying out for the shoot. I had know idea that when I arrived on location that not only the Architect would be on site but about twelve other personnel as well. 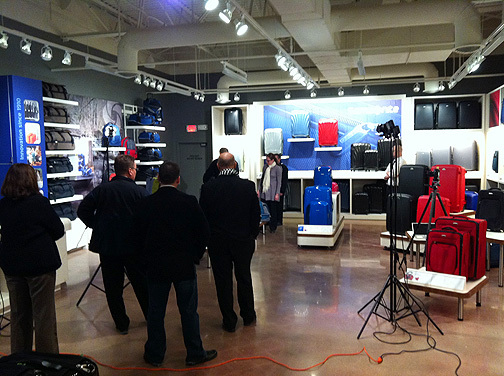 Just a few of the people on the shoot! 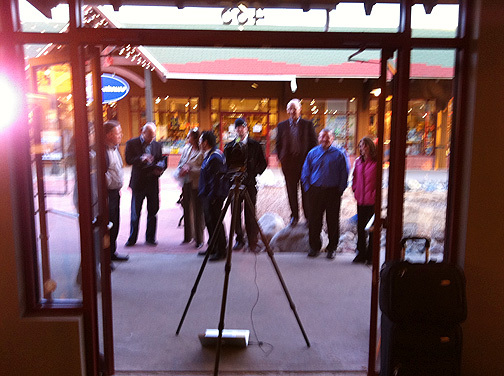 Not only was the Architect there, but several corporate folks from Samsonite were on site as well. 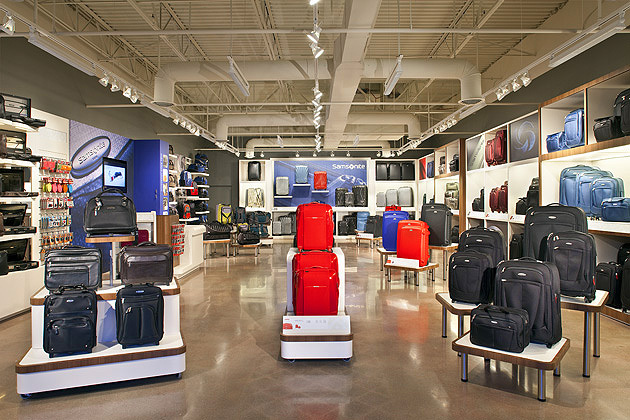 With this large of a group of people in a store 30×60 it can make things a little tight to say the least. 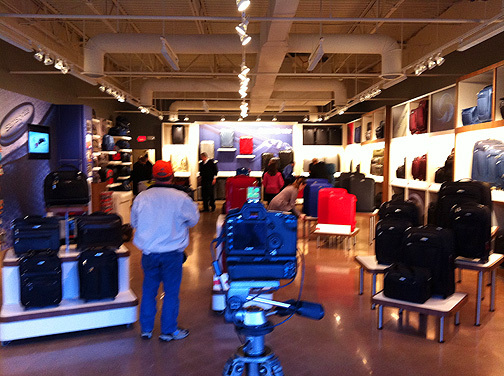 Not only were we shooting for the Architect but we also had to keep Samsonite and their products in mind. This is another example of a cost share. Both parties were splitting the fees for the photography. This was a great group of people and everyone worked in sync with one another with the common goal in mind. The shoot went without a hitch! 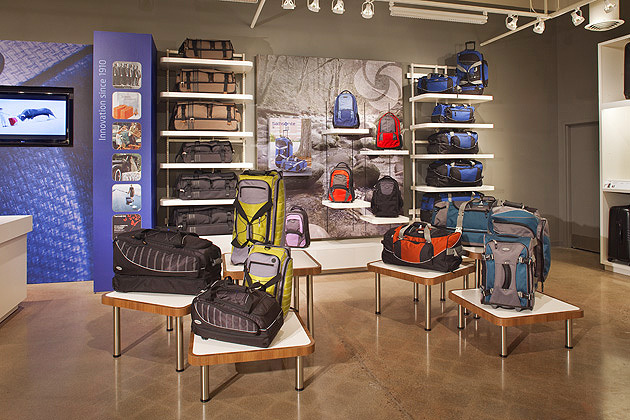 There was lots of running around placing product and lighting in just the right areas to highlight the bags to the clients liking. We needed to work quickly because the next shot would be a dusk image of the exterior of the building and as always the sun was a major factor. 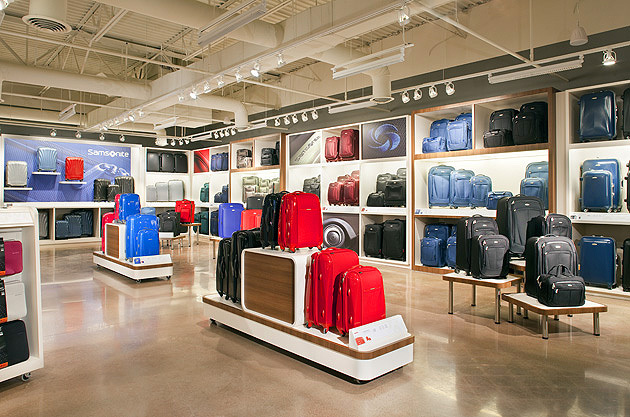 After the exterior image was captured we were then able to slow the pace down just a little and turn our attention back to the interiors of the store. Setting up for another interior. The evening wrapped up at about 9:00 pm with several more interiors captured. Thankfully the store was closed on our behalf several hours earlier than normal so we could work without the interruption of shoppers. To be real honest though I really don’t think a few other people in the store would have bothered us at all!